Cut to grow, people! Cut to grow! This week, we’ll see Donald Trump’s plan for US government spending in the next fiscal year. We’ve already been leaked a preview suggesting the major themes: Bulk up defense spending, don’t touch Social Security or Medicare, and cut the rest of government spending enough to make up the difference. The problem with this strategy is that there is little left to cut. US social spending already dominates the budgetary picture and America vastly outspends other large countries on defense. Which means that Trump’s strategy—executed by Mick Mulvaney, his new Office of Management and Budget director—all but guarantees an increase in public debt, at the expense of investments in research and infrastructure that at least hold the promise of long-term gains. Trump advisers, in a background phone call with reporters, promised a $54 billion cut in non-defense spending, approximately a 12% cut from current spending levels. It’s not clear what specific programs will get the axe, though the Environmental Protection Agency ($8 billion annual budget) and the State Department’s foreign aid expenditures ($50 billion annual spending) have come up. The White House will likely leave Congressional Republicans the hard work of allocating the pain. But even if spending on everything but social services and defense were eliminated entirely, it would be replaced within four years by growing social services payments that Trump says he won’t touch and the commensurate rising interest payments on the national debt. That “welfare state” category includes government health programs like Medicare and Social Security, plus welfare and veterans benefits. Its recent growth was driven by a massive expansion of care under the Affordable Care Act and the retirement of the Baby Boomer generation. The ACA’s coverage expansion also included efforts at cost control to pare back America’s world-leading health care costs. By exempting Medicare and Social Security from cuts, Trump is ignoring the biggest drivers of US spending. That’s not an uncommon position for the establishment politician Trump is becoming. Indeed, he’s said he will attempt to cut spending on Medicaid, the health program for the poor, though it’s not clear if Republican governors are willing to go along. Then there’s defense spending. It fell during the Obama years, as the previous administration attempted to pull back from US commitments in Iraq and Afghanistan. The Trump national security team is planning deeper engagement with more US troops battling Islamic extremists in the Middle East, and will need a commensurate boost in funding. Trump also has promised to revive expensive investments in new naval ships and aircraft, a boon to military contractors, and investments in more soldiers. Pentagon officials have deep concerns about what the recent reductions mean to US forces’ readiness (pdf), but outside experts regularly question whether military spending is as efficient or effective as it ought to be. At a time when the national debt is rising and the president has said that US allies need to spend more on security so the US can spend less, it is a curious posture. So what about the cuts? Domestic discretionary spending, defined in the chart above as infrastructure and everything else, includes investments in highways, bridges, and ports, broadband networks, the entire US international diplomacy and aid budget, NASA, research grants from the National Institute of Health and the National Science Foundation, the FBI and the rest of the US Department of Justice, the EPA, financial regulation, workplace safety inspectors, community development block grants, and, well, you know, everything else. 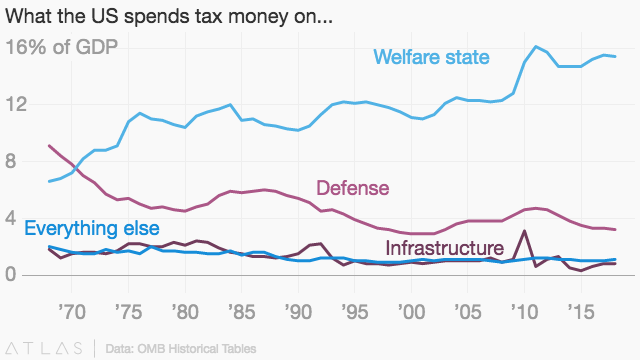 While the US stimulus bill gave infrastructure a boost in 2010, since then domestic discretionary spending has been on the chopping block as Democrats and Republicans have jealously guarded the two other categories—defense and entitlements—in their ongoing fiscal stalemate. In 1990, the US spent 3.1% of GDP on domestic discretionary items; today, it spends 1.6% of GDP—effectively a 50% cut. Ultimately, there’s just not enough to cut while protecting the president’s other priorities. Now that Republicans are in control of the legislature and executive branch, we appear to be witnessing a return to the George W. Bush era of fiscal policy: Tax cuts and spending increases combining to drive up US borrowing. You could have seen it coming. Correction: This story originally mistakenly referred to the National Academy of Sciences, which is not a grant-making institution, instead of the National Science Foundation, which is.